A Namibia small group safari will showcase the finest of the country, allowing you an intimate encounter to remote areas. With just 14-17 people on tour, a small group safari tour will give you the chance to enjoy your adventure through the region without a large crowd. Pick your own level of comfort – from roughing it in a rugged camping excursion, or spending nights in luxury in an accommodated option. During your Namibia Small Group Safari, you’ll visit the capital of Windhoek, the vast Namib Desert, the incredible Etosha National Park, and more. 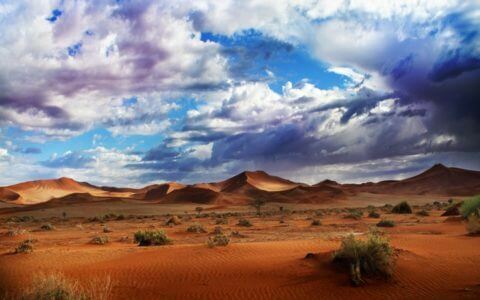 Visit the desert landscapes of Swakopmund, where you can partake in various exhilarating sport activities, explore the scattered shipwrecks along the Skeleton Coast, or trek up Dune 45 in Sossusvlei for a spectacular sunrise view over the seemingly endless sandy terrain. Namibia small group safari holidays also allow for visits to the wonderful Namib-Naukluft National Park, as well as Damaraland, where photographic opportunities are rife. The landscapes here are beautifully dramatic, with red-hued mountains, huge rocky hills, and vast, sandy plains just waiting for you to discover. Budget small group safaris in Namibia are available if you’re a super saver, but no matter what choice you make, it will be a good one. Small group safaris are a great way to form special bonds with a select few people who share these exquisite African moments with you. There is no doubt you will leave the continent a changed person, with remarkable experiences etched into your memory. For more information contact a consultant now, or alternatively, take time to browse through our Namibia small group safari packages online.